This library is maintained by the Symposium to help you stock your own library of jewelry-making and manufacturing knowledge. If you missed an event you really wanted to attend, or if you attended a presentation for which you’d like to have a print copy to keep as a reference, this is the perfect solution for you. Each paper is available individually as a FREE digital file that you download and read or print as you wish. Please remember that these are copyrighted materials and may not be distributed to a third party for any reason. 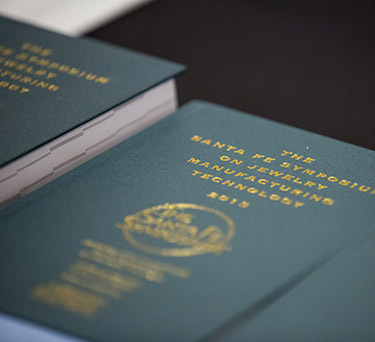 Complete collections of the presentations for most of the Santa Fe Symposium® events are available for purchase in printed book form from Rio Grande.